What do I miss most about Café Du Monde? Two words: fried dough. Also, powdered sugar. Heaps of powdered sugar. Most of which will land on your blouse, pants, skirt, dress, suit jacket, tie, whatever. Maybe even your socks. It’s impossible to eat at Café Du Monde without making a mess of yourself. But that’s part of its charm. You may be thinking “Perhaps I would order something other than beignets, then I wouldn’t get messy.” You also wouldn’t get fed, seeing as there is exactly one food item on the menu. She bought a Post and a Times-Picayune from a sidewalk vendor and found a table in a deserted corner of Café Du Monde…A waiter finally made it by, and she ordered coffee and a plain bagel. John Grisham might ought to have added that she (Darby) waited there till three days after the world ended and never did get served. There are no bagels, plain or otherwise, at Café Du Monde. And if “deserted corners” exist there, I’ve never seen them. But perhaps the crowds thin out at some point in the 24 hours they’re open each day. Anyhoo, I sat at a hard-to-come-by table with various members of my family and was amazed that our waitress felt no need to write down the order. Later I realized this wasn’t such a miraculous feat given the limited menu options. After a few minutes wait, we were presented with a pile of deep-fried dough covered under a mountain of powdered sugar. “This,” I thought, “is where I want to go when I die.” Which if I had the chance to eat there every day would happen sooner rather than later. On the way out, one of us spotted a yellow box of beignet mix. Hallelujah! No longer would I be satisfied with makeshift donuts made from canned biscuit dough. Not when I could recreate the Café Du Monde experience at home. Sadly, eating “homemade” beignets isn’t nearly as much fun because A. No cooks or waitresses and B. People-watching opportunities are limited. Besides which, deep frying dough requires a certain patience and skill that I lack. 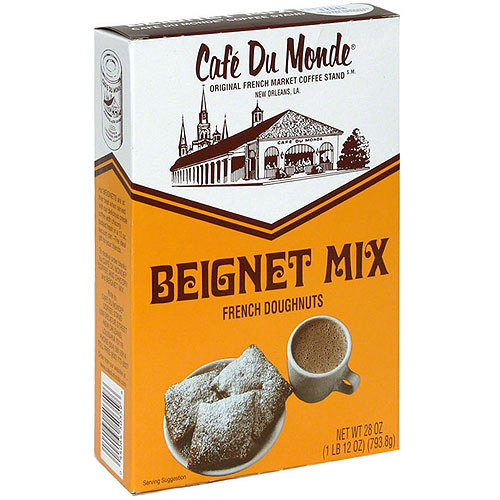 I probably still have a long-since expired box of beignet mix hiding in one of my kitchen cabinets. Yes, y’all, they also sell coffee. Ok, so. I’ve heard tell that they make a mighty fine cup of Joe. I will take y’all’s word for it. Even after a decade in Seattle, I’m still not a coffee drinker. But maybe that’s because I haven’t tried Café Du Monde’s legendary café au lait, half coffee and half hot milk. According to their website, the chicory softens the bitter edge of the dark roasted coffee, adding an almost chocolate flavor. Sounds sort of like hot chocolate with extra caffeine. I will order a cup next time I’m there and report back. In the meantime, if you can’t get to the New Orleans area in the foreseeable future, don’t despair. On second thought, go ahead and despair. 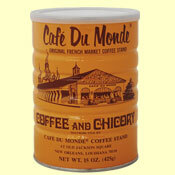 But know that you can order cans of chicory coffee and boxes of beignet mix direct from Café Du Monde here. The prices are quite reasonable, until you get to the shipping charges. Consider yourself warned. What’s your fondest Café Du Monde memory? How many beignets can you eat in one sitting? And is chicory coffee really tastier than the regular stuff? Photo Credits from Flickr Creative Commons: Cafe Du Monde exterior by praline3001; Plate ‘o Beignets by Tammy Camp and Café au Lait by Gwen Harlow. Now you’ve gone and made me miss NOLA! I read Grisham’s Pelican Brief and wondered about that bagel — thanks for clearing that up. Beignets are so much better than bagels in every way, especially the powdered sugar part. Sorry I can’t help you with the coffee — I haven’t drunk that since I was a little kid pretending to be a grownup and drinking milky sugar with a splash of coffee! Here’s the deal: I planned my honeymoon around my first trip to Cafe Du Monde. Seriously. Not joking. We got hitched in Texas, drove 8 hours to New Orleans, fell asleep. Woke up the next morning and headed straight to Cafe Du Monde. We had plans to eat at other breakfast locations during our visit, but we ate at Cafe Du Monde EVERY MORNING instead. So freaking good. The coffee. It killed me. I don’t remember the taste of any other food on our honeymoon except Cafe Du Monde. I had plans to go to NOLA for xmas, but they fell through. I can’t wait to eat here! Lassiez les bons temps router! Kim, you are killing me here. Yum. Love this place and can remember going there as a little girl. We are two and a half hours away now, and are in desperate need of a trip over. – And yes, the coffee is strongly sensational. I like going to the back side of the building where there is a little window you can peer in to see the workers flinging flour and sugar everywhere. There’s a permanent white cloud drifting through the air, and they’ll smile and wave through the sugary fog. I just found your blog! Why did you stop?? This is my life…………..scary I just read the first year’s posts and could identify with almost all of them! Kinda scary how southern I am………hope you start blogging again soon! I know this post is old but I have to bring up the age-old New Orleanian debate, Du Monde or Morning Call?